Awhile back, I shared that we need to be willing to admit we were wrong. Not just apologies for moments, but also for speaking out about an issue or something and then changing our mind. If we spoke up about it, then we need to speak up when we change our minds too. Admit we were wrong. As I mentioned in that post, I’m going to share some ways that I need to admit I was wrong. Today is one of those posts. I have had a white noise machine in my room for…. at least five kiddos. Probably six. Started with a fan in the room with HB and Noah because we lived in an old mobile home where you could hear and feel every noise. Then after awhile, we bought a sound machine so that we didn’t freeze our kiddos out in the winter. 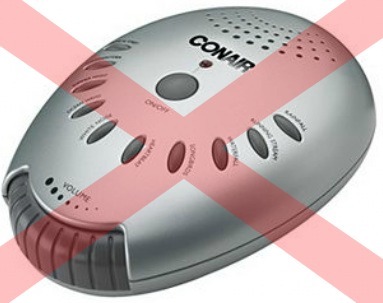 At one point, I had three white noise machines I had bought at garage sales so I would always have one handy. And I used one in my room because I had become accustomed to them after six kiddos. When a friend said that white noise machines were bad, I blew her off. And when other friends asked about using them, I shared my experience. Then one day, on Facebook, a friend asked and that same other friend shared that white noise can cause auditory processing problems. I still refused to heed the advice and shared that I loved our white noise machines. But the comment about auditory processing stuck with me. After we received an in utero diagnosis of Down syndrome for our daughter, the auditory processing issue had an heightened sense of importance. 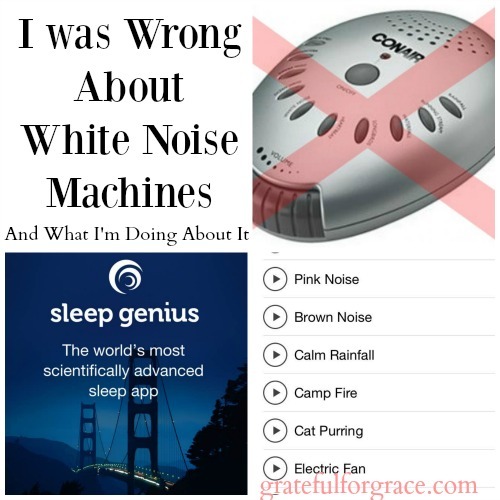 I did an internet search and I read this blog post by Mommypotamus titled Why I Ditched My White Noise Machine. And then it all made sense. And I realized I had been wrong. While there was no way I could buy the Sleep Genius system in that post, I did get the Sleep Genius app. It was hard for me to adjust to, but I did. Then after the NICU gig and my sleep pattern being interrupted, I switched to a different app that has pink noise as an option. And it works beautifully. And it doesn’t interact with my brain in the way white noise does. And it’s just as easy. The Sleep Genius offers a Baby Sleep Genius, but I haven’t tried it. I will soon. I’m really really grateful the Lord softened my heart towards hearing this new information before Jubilee was born. Since people with Down syndrome can struggle with processing, language delays, and cognitive function, I am glad I didn’t put a stumbling block in front of her. She usually sleeps with no aides, but sometimes, if the house is exceptionally noisy, I play the pink noise for her. I was wrong. White noise actually can cause issues for our brains. Choosing something else is a better option. Like Mommypotamus, I won’t say that white noise is always bad. If you can’t sleep somewhere and it’s affecting you, a good night’s sleep is better than staying up all night. And since there are other options that don’t do what the white noise does to the brain, I choose that. Pink noise doesn’t create a wall of noise and still helps sleep. The Sleep Genius specifically designed sound combinations are even better. Have you heard the information about white noise?